My very good friend, Barb, and I are at it again. Simul-blogging our adventures with stitching, that is. One of us is in Toronto, Ontario while the other is in the Forth Worth/Dallas area of – well, of course you all know where that is – Texas. Thanks to e-mails and our blogs, that distance is nothing. I’ve been fascinated by the cover quilt, Passacaglia, of Willyne Hammerstein’s Millefiori Quilts book because of the intricacy of it and because I absolutely adore five-pointed stars.The way the Passacaglia quilt is constructed is quite remarkable. Without the book, I doubt I could have figured it out just from a picture. 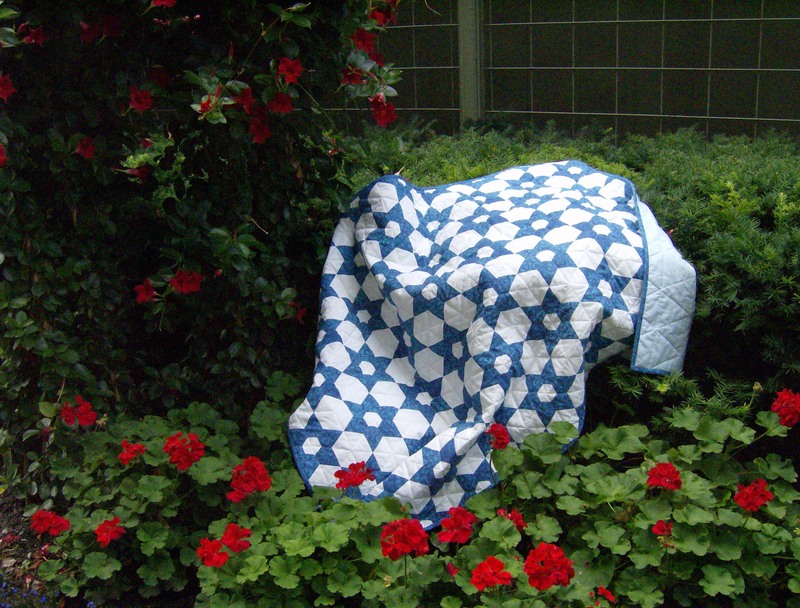 And there are other quilts in the book that are really, really intriguing. It’s definitely a book full of inspiration for me and a fabulous addition to my quilt library. 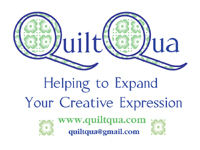 If you click on the picture of the book cover, you’ll be taken to the Inklingo page for the book with some really fabulous photos of Passacaglia and some other quilts in the book. So when the two new Inklingo collections for it (one has 3 centimetre shapes while the other has 1.5″ shapes) were released last Friday, I just knew that Barb would love stitching this – and she was just as intrigued by it as I was. So the e-mails were flying fast and furious as we discussed which size, fussy cutting/not fussy cutting and the decision we should simul-blog about this. Then our respective printers were smoking and rotary cutters flying as we printed and cut out our shapes. And the e-mails were still flying, this time with some pics. My fascination with the five-pointed stars meant that’s what I had to begin with. And a picture was taken when a few were together. And more e-mails flew back and forth. 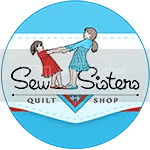 Because of the never-ending continuous stitching possibilities, this is a hand piecer’s dream block with all those chances to turn a corner and keep adding pieces without breaking the thread. Those types of blocks are just way too much fun. And when you add the perfect stitching lines and matching points that Inklingo prints on the back of fabric, this block really is a dream to piece. No worries about things fitting together. They just do. Perfectly. Every time. I stitched and stitched throughout the weekend and early this week and got my first rosette finished. Every stitch was nothing but fun. I couldn’t resist using some of the Paris Flea Market fabrics for this. I used the 1.5″ size and this rosette is approximately 16.6″. I’m going to add pieces to square this up and either make it a centre medallion for something or turn it into an extra-special stitching book cover. Now you absolutely have to head over to Barb’s Passacaglia blog post. But not only to see her rosette – and I admit, I’ve had a sneak peek. It’s stunning. But you also will want to see the video of her adorable kitty, Pappy, and his new obsession which I absolutely cannot wait to see. Barb‘s blog posts are not to be missed – ever! I think this picture of Baxter’s drinking method might just show why he keeps a close eye on the water bowls. This is a scene we see numerous times every single day – after we hear a certain meow to announce that he’s about to put on the water show and letting us know we should drop everything to watch. Which we do. Almost every time. Mr. Q.O.’s caption for this one? “Where are the flowers and birds? Are they ever coming back?” I won’t say a thing about the extreme cold weather alert we had again last night. But at this rate I figure we’ll be lucky to see birds or flowers by June so Jake may be looking somewhat forlornly out the window for a while longer. And if you’re still here, reading this – head over to Barb‘s blog! Oh wow! I had no idea of this book- I have to order it! Love your block !!!! You and Barb are definitely obsessed by difficult and tiny stitching!! I’ll have to enjoy this through you, I would never attempt it. Amazing block! I need to get started on one! Spring is coming, my yard was full of robins and blue birds and it will be in the 60’s this weekend and all next week, it’s coming your way! Don’t give up! Pappy and I had to go play in the snow today so I’m late commenting here. I love your block! And I’m so glad you gave an explanation about the different sizes and more about the book, etc. I forgot all that last night when writing!!! LOVE the ‘toon!!! My cute T for the Texas Rangers too. So many cute details. And sweet Baxter drinking while Jake nonchalantly eats on…. CUTE! Great blog, Cath! Looks like someone has baseball on their mind too. Ah, the men in your life. It looks fabulous Cathi as I knew it would be and beautifully stitched. Now I am heading over to see what your friend is doing. Loved reading your blog post today and Barb’s too! I am fascinated by this project but too scared to jump in! Lovely. You are such an influence on me. Time to try this one too. Oh.. That is cool!! Wow! I could take the five pointed stars make the circle and applique it. That is an outstanding block. You and Barb are really getting into this. Your block is gorgeous (and so is Barb’s) I have had the book for a while but want to finish a few other projects first. Of course when I saw the Inklingo offer I had to purchase it! Can’t wait to get started on this quilt. There are so many beautiful versions being done. I’m really going to enjoy watching this project grow! Oh my goodness, Cathi – your work never ceases to amaze me. Your Millefiori block makes me want to quit quilting and switch to needlework!! I absolutely love that block!!!! Good job – heading to Barb’s blog RIGHT NOW!